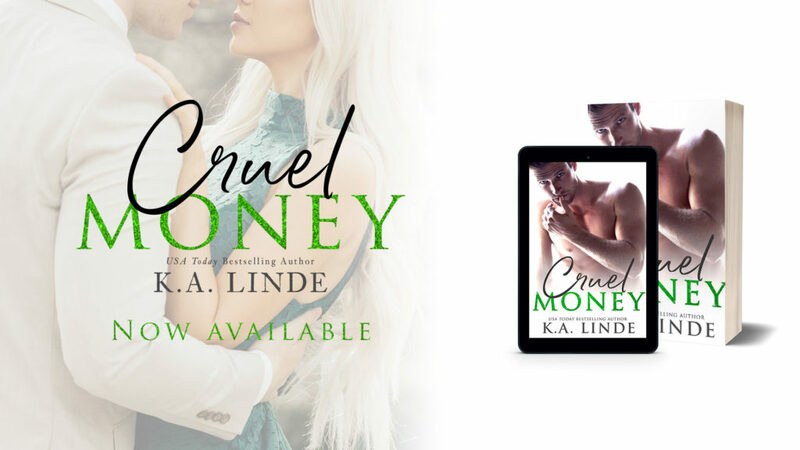 CRUEL MONEY by K.A. Linde has all the vibes of Cruel Intentions. The upper elite CREW being involved with a bet to sleep with make said chose girl fall in love. There is a plethora of scheming and lying, and just like the movie, I was entertained throughly by the corrupt and flawed characters of the CREW. A wide range of characters make up the CREW, and while I do understand their presence in the book, few of them had any real part in the book past being plot devices to push the story forward. Because I found them intriguing as individuals and their dynamics as a group, I would have liked to see more, and that might occur as this is just book one in a trilogy. Penn is an interesting heroine. It is easy to see why Natalie falls for his charm. He is intelligent, gorgeous, seemingly kind, especially with her. Like the philosophy he studies and teaches, it isn’t so clear cut as to whether or not he is good or bad. He is a mash up of the upper east side bad boy who takers what he wants and the philosophy professor who works to be nothing like the supercilious members of the elite society he cane from. It is hard to tell where he where fall in this story, but I’m hoping for the good because I did genuinely like his character. Natalie is for all intents and purposes “the help.” She isn’t from their world, is thrust into their group because of her job as a vacation home babysitter. There is an ease to Natalie. She owns who she is, doesn’t really make apologies for it, and she doesn’t allow herself to get pushed around by the elite. Natalie does fall for Penn relatively quickly, which stems from her past, but we didn’t really see those past moments. Possibly with flashbacks, the quick fall into love would have been more understandable, maybe make the fallout more heartbreaking. The story, while engaging with the scheming of the Crew and the great chemistry between Penn and Natalie, is predictable. I knew from the beginning of the story what the cliff hanger would be and the basic plot. Even the surprise twists are foreshadowed enough that when the plot reveal happens it wasn’t shocking at all. There are also some plot revelations and characters that are introduced to, again, push the plot forward but didn’t seem developed enough, making the character come across as too harsh or the feelings seem implausible. I am still dying for the next book. I was surprised by the events that set up the next book that are revealed in the epilogue, and I’m looking forward to seeing this already strong heroine take on the CREW now that she has her eyes wide open. I am also equally curious to see how the Crew and Penn have been affected by the ending of Cruel Money. K.A. Linde has certainly captured my intention with the amoral, upper east side society. The corruption, the selfishness, the lack of care for others is a compelling story-line that has intrigued society for ages, and with the added romance of Penn and Natalie, Linde has created another fantastic novel. I’ll have to add K.A. Linde’s books to my tbr.